Martin Scorsese’s more than forty-year career as a film director has encompassed a wide range of subject matter and film genres, but he has always had a signature style of pulling out all the stops in terms of cinematic mise-en-scène. So there had to be some sense of anticipation when he chose to make a film concerning the father of cinematic flamboyance, the pioneering filmmaker Georges Méliès – and in 3-D, to boot. The resulting film was Hugo (2011), which is based on Brian Selznick’s illustrated adventure novel, The Invention of Hugo Cabret. The story set in Paris in 1931 concerns Hugo Cabret, a 12-year-old boy who lives alone in a cramped machine room in the Montparnasse railway station, where he winds the station’s big mechanical clocks. Early on in the story, the viewer is informed via flashbacks that Hugo had been living happily with his widowed clockmaker father, but the father had recently died in a fire at the museum where he worked. Hugo was then taken in by his uncle, a heavy drinker who orders the boy to help him look after the Gare Montparnasse clocks. Not long afterwards the uncle drowns in the Seine, and the now-alone Hugo is left to his own devices to look after himself and avoid getting sent to an orphanage. 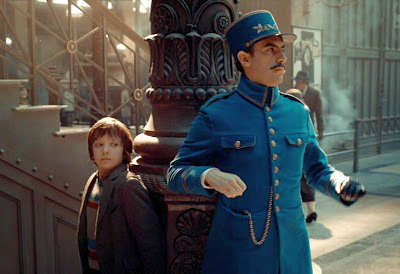 The boy keeps maintaining the station clocks and routinely steals food from the vendors in the station, always trying to avoid getting caught by the beady-eyed station guard (played by Sacha Baron Cohen), whose life’s passion, it seems, is to arrest street urchins and have them sent to the orphanage. Hugo seems to have inherited a mechanical aptitude from his beloved father, and the magic of mechanical operation seems to be a major theme of the film. Hugo’s father had been working to restore to working order a mechanical man that he had recovered from a museum. This mechanical man, a true automaton, had been so ingeniously designed that it could sit at a table and write a message. But when found in the museum, it needed some repairs, and Hugo’s father had not completed the task before his death in the fire. Now in his spare time Hugo continues his father’s task of trying to fix the automaton, using his father’s notebook to help guide the work. 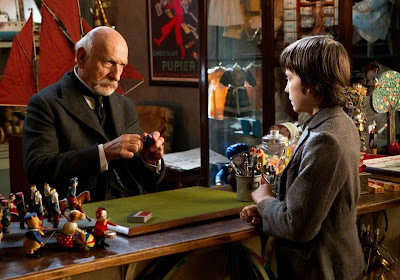 To obtain needed parts, such as springs and gears, the boy often steals mechanical toys from a train station toy store kiosk that is run by a grumpy old man. On one such occasion, the grumpy shopkeeper snatches Hugo’s vital automaton notebook and compels the boy to work in his toy shop for some time in order to regain it. In this process Hugo meets the shopkeeper’s adopted goddaughter, Isabelle, who is about Hugo’s age and becomes Hugo’s only friend. Eventually, with the help of Isabelle, Hugo manages to fix the automaton, which immediately makes a drawing that leads Hugo and Isabelle to an astounding discovery. Isabelle’s godfather is in fact the famous early filmmaker George Méliès, whose cinema career had subsequently faded and left him bankrupt, to the point where he was reduced to operating a dingy toy shop. It turns out that prior to his filmmaking days, Méliès had been a stage magician and a craftsman fabricator of robots. It was he who had originally constructed the automaton now in Hugo’s possession. Hugo and Isabelle both want to learn more about Méliès (Isabelle had not known about her godfather’s past). Through the assistance of a friendly bookseller (played by Christopher Lee), they meet a film historian, Rene Tabard, who is devoted to Méliès’s legacy and who possesses what is thought to be the only remaining copy of Méliès’s legendary film, Voyage to the Moon. Together they meet Méliès at his apartment and cheer the legendary filmmaker by celebrating his glorious past. 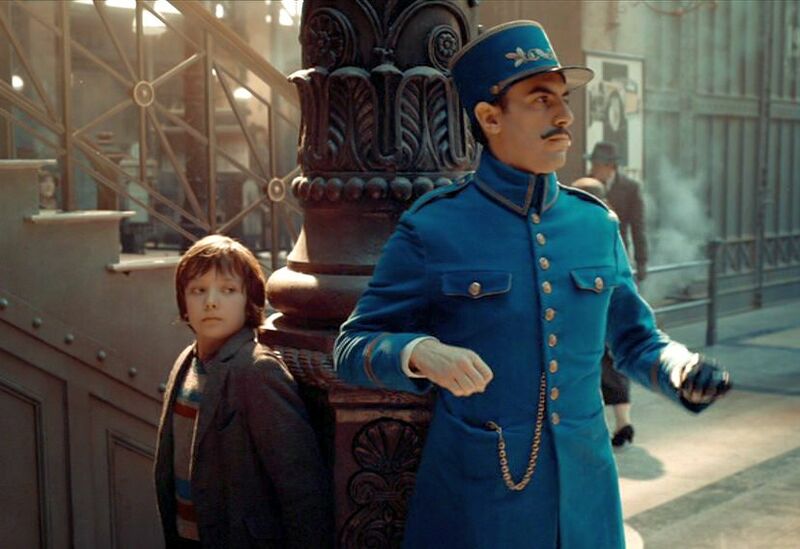 Hugo rushes back to the train station to retrieve Méliès’s automaton and show it to Méliès, but while returning he is snatched by the nasty station guard with the intent of shipping his prisoner off to the orphanage. But Méliès shows up at the station in the nick of time and rescues the boy. The film concludes on a triumphant note, with Tabard organizing a public tribute recognizing and celebrating Méliès’s accomplishments. Hugo is a curious film, because, as with many of Scorsese’s works, the film’s narrative coherence and resolution are somewhat vague. Scorsese has a knack for creating very involving and dramatic cinematic milieus, but then allowing the narrative progression to get lost somewhere along the way. So we often wonder, what is this film really about? In this film it seems to be about the journey of young Hugo, but the entire second half of the film is essentially a celebration of the works of George Méliès, and our focus on Hugo’s fate is gradually lost. To be sure, this movement is a reflection of Scorsese’s abiding interest in film history and historical film preservation, but this film is supposed to be about Hugo’s quest. Although at the end Hugo has found a home and friends, what were his essential attributes or accomplishments that led to this satisfactory outcome? What was the overall theme of the film? Certainly there is an interest in fantasy and magic. Méliès was originally a stage magician, and his interest in creating illusions led him to see that the new medium of filmmaking offered a splendid vehicle for creating more elaborate fantasies and illusions. He was the originator of many film special effects – in fact Méliès virtually created that subfield of cinematography. Scorsese seems not only to want to memorialize Méliès but also to celebrate the very idea of cinematic fantasy. This is supported by the 3-D extravagance and the cartoon-like portrayals of the stock characters in the train station, such as the station guard. 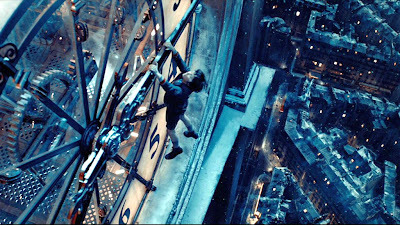 Sometimes Scorsese’s overtly rhetorical use of special effects in Hugo takes center stage – at the expense of the narrative storytelling. There are numerous camera shots taken from bizarre camera angles that have no narrative motivation, other than perhaps to create a sense of strangeness. For example, when Isabelle discovers and pulls out a box of papers from a wardrobe in Méliès’s room, the camera perspective is from inside the small upper compartment of the wardrobe. This is one of many shots for which there is not intuitive feeling for the point of view. There are also a number of high overhead camera shots that are not establishing shots and seem to be present simply to create a startling perspective. These shots appear to be present in the film primarily to exploit 3-D technology, which can admittedly accentuate the feeling of contextual immersion, but which should not be used just for its own sake. There are two visually spectacular sequences in this vein that do stand out, however. One is the recreation of the famous Gare Montparnasse train derailment of 1895, which is shown as part of a nightmare that Hugo experiences one night. The other memorable scene is the film’s closing tracking shot, almost two minutes in length, which starts out from outside an apartment window and tracks inside to an ongoing party and circles around the principal characters, all of whom are shown to have reached some level of final fulfilment. In the history of long cinematic tracking shots, this one is worth keeping in the vault. But there is something more here than just the evocation of fantasy. Scorsese is also emphasizing the magic of mechanical operation. 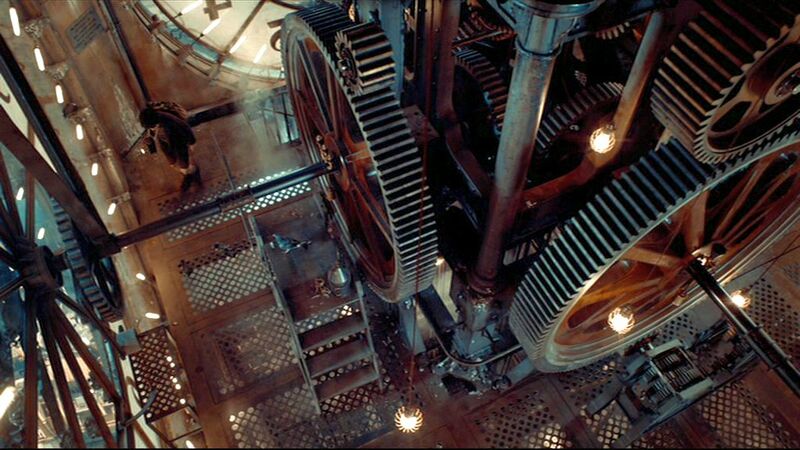 Throughout the film Hugo is awash in clockworks that are a tangle of interlocked gears and levers. The automaton that can write a message is operated purely by wound-up springs that operate a complex web of mechanical components. Given our current obsession with computer and electronic controls and media, it is easy to forget, and useful to be reminded, just how amazingly complex and wonderful purely mechanical operations can be. After all, Charles Babbage’s original computer in the early 19th century was a mechanically operated device. And in the historical setting of this film, it was the ingenious construction of the movie camera and projector that amazed and astonished people even more, because it could evoke an entirely new world of the imagination. But however amazing the mechanically produced operations may be that drive these fantasy-producing machines, it is important to keep in mind that the truly amazing creation takes place in the mind of watcher. It is the viewer who constructs in his or her own mind the alternative reality that is based on the images that are projected on the cinema screen. That is where the real magic does (or does not) take place. Méliès, the illusionist, exploited that human facility, but we are not given that focus in Hugo. Instead, the focus in Hugo is purely on mechanical operations. And this mechanical operation is presented as basically magical, even though we know that both Hugo and Méliès understand how all these things work – how the purely cause-and-effect operations and interactions of mechanical components lead to inevitable outcomes that can be well understood and are not truly “magical”. So the film is one of two halves. 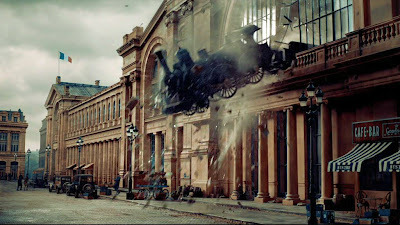 In the first half of the film, the story focuses on the mostly ludicrous, slapstick encounters of Hugo trying to escape the clutches of the station guard. These scenes are meant to evoke the exaggerated style of early silent-screen histrionics. The second half of Hugo centers on Méliès and his inventive illusionist creations for the screen. A thematic linkage between the two halves seems to be the notion that mechanical inventiveness lay behind all these illusions and perhaps that mechanical ingenuity has a close connection with artistic creativity. At least the two were apparently connected in the person of Méliès. But I believe that our capacity to imagine and fantasize are quite different from the mechanical. We use the mechanically-contrived devices as tools to help elevate human consciousness, which is of an entirely different nature from the mechanical.